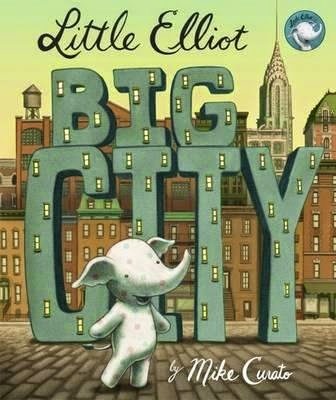 Little Elliot the Elephant lives in a magnificent Brownstone in New York City (green!). He loves living in a big city but sometimes it's hard being so small in such an enormous place. When you're so little, you have to be very careful not to be stepped on. It's tough reaching doors and let's not even talking about hailing a cab or buying a cupcake at a local shop where you practically appear invisible, even when you're the cutest spotted elephant around. This is an adorable story about perspective and the understanding that there will always be someone larger, smaller, smarter, faster than us. I also love how this story helps kids see that helping those smaller than ourselves can make us feel huge. Striking, richly-painted illustrations lend emotional intensity to the text, coupling dark, moody scenes with the light, bright beauty of this adorable little elephant. Perhaps the best things really do come in the smallest packages.